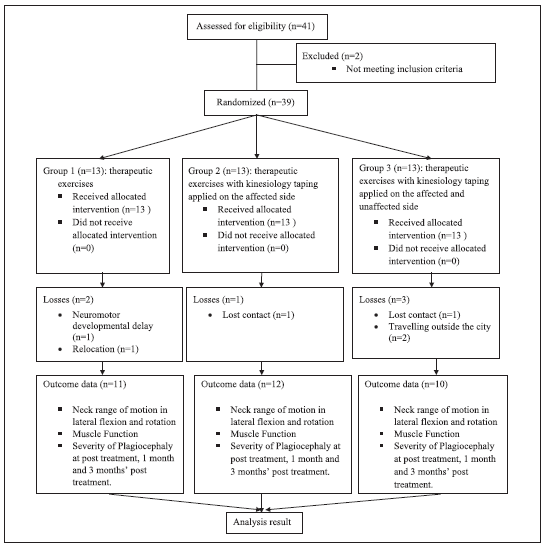 A randomized, single-blinded pilot study evaluating the effects of kinesiology taping and the tape application techniques in addition to therapeutic exercises in the treatment of congenital muscular torticollis. Giray E1, Karadag-Saygi E2, Mansiz-Kaplan B1, Tokgoz D1, Bayindir O1, Kayhan O1. 1Department of Physical Medicine and Rehabilitation, Marmara University School of Medicine, Istanbul, Turkey. 2Department of Physical Medicine and Rehabilitation, Marmara University School of Medicine, Istanbul, Turkey evrimkaradag4@hotmail.com. To investigate the effects of kinesiology taping and different types of application techniques of kinesiology taping in addition to therapeutic exercises in the treatment of congenital muscular torticollis. Prospective, single blind, randomized controlled trial. An outpatient rehabilitation clinic in a tertiary university hospital. Infants with congenital muscular torticollis aged 3-12 months. Group 1 included 11 infants who only received exercises, Group 2 included 12 infants who received kinesiology taping applied on the affected side by using inhibition technique in addition to exercises. Group 3 included 10 infants who additionally received kinesiology taping applied on the unaffected side by using facilitation technique and on the affected side by using inhibition technique. Range of motion in lateral flexion and rotation of the neck, muscle function and degree of craniofacial changes were assessed at pretreatment, post treatment and, 1 month and 3 months’ post treatment. Friedman analysis of within-group changes over time revealed significant differences for all of the outcome variables in all groups except cervical rotation in Group 3 (P<0.05). No significant differences were found between groups at any of the follow-up time points for any of the outcome variables (P>0.05). There is no any additive effect of kinesiology taping to exercises for the treatment of congenital muscular torticollis. Also different techniques of applying kinesiology taping resulted in similar clinical outcomes.